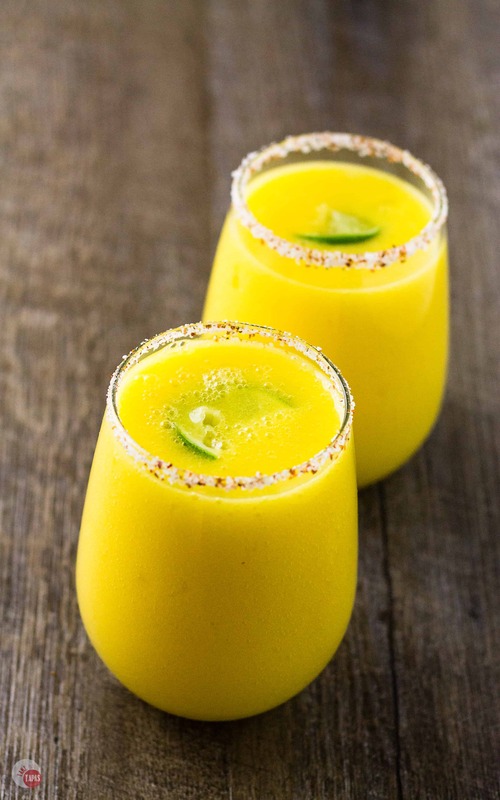 The delicious flavor of ripe mango mixed together with traditional margarita ingredients and a spicy salt rim create the perfect blend of cocktail and tropical feelings. Take a sip of my Spicy Mango Margarita with a spicy Tajín Salt Rim Clásico and start your weekend right! Mango season starts in May and I have you ready to enjoy the fruit of the season with this Spicy Mango Margarita! Mangoes were Braxton’s favorite fruit and I know he loved them but he really just loved seeing me struggle to peel and dice them. 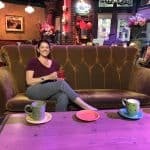 Does anyone else have problems with this? The pit in the middle just seems to get bigger and bigger and never sits right in the middle of the fruit. Like it is just mocking me on purpose! It’s a good thing that mangoes are nutritious or I would have given up a long time ago. My grandparent’s house in Miami had mango trees in the backyard and I always remember just pulling them off the tree and getting their sugary syrup/juices on my hands while carrying them to the kitchen. When they hosted BBQs in the backyard people from all over would come and watch my Pa man the grill like a pro and keep the chicken basted and juicy, all while chatting it up over a cocktail and some fresh mango that Ma just cut up. Man, I miss those days! To balance out all the sweetness of the mangoes I love to add a little heat. Be it with a jalapeno, chili powder, or some crushed red pepper, I feel a little heat makes the sweet that much sweeter! For this Spicy Mango Margarita, I am adding heat two different ways. One with the addition of my Chili Pepper Simple Syrup. The second way a spicy salt rim that adds a little kick with each sip. A traditional salt rim is great and all but I like to kick mine up a bit with the addition of a special seasoning that my friend Chrissy introduced me to. You know Chrissy when she guest-posted with her amazing pickled red onion recipe and a Basil Martini with Black Pepper and Lime. Chrissy served some tacos at her house one night and on the counter I saw a seasoning mix I haven’t seen before. Tajín Clásico Seasoning is an amazing combination of chili peppers, salt, and dehydrated lime juice. It’s the dehydrated lime juice that really gives it a unique flavor that pairs well with ANY Mexican food and it pairs really well with chicken and steak. I haven’t tried it on fish yet but I can see it making an appearance on some fish tacos in my very near future! 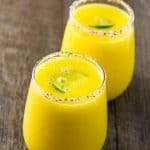 This Mango Margarita is easy to prepare with fresh mango pureed with a little water to make a fruit puree that is great in this mango margarita and your morning smoothie if need be. Just pour the extra puree into a few of those weird ice cube trays that still come with your refrigerator for an easy-to-pop in mango infusion! A little mango puree, some tequila, a hint of my chili pepper simple syrup, and a squeeze of lime and you are ready to go! Don’t forget to rim your glasses with the salt and Tajín Clásico Seasoning for an extra kick! 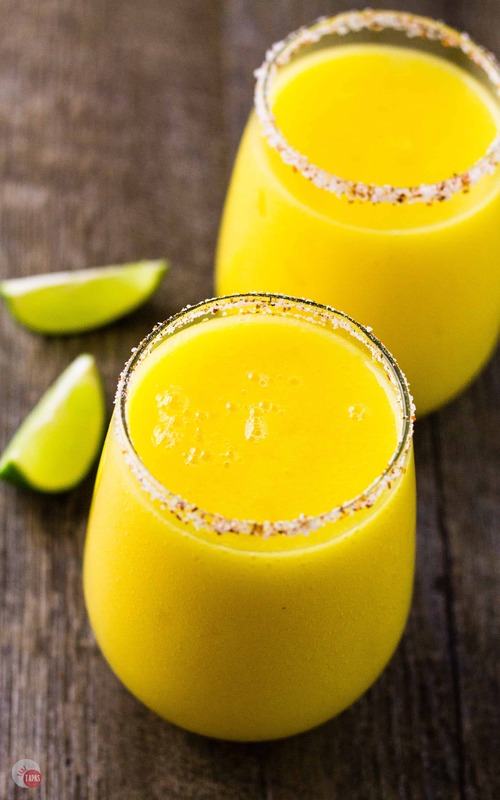 Cinco de Mayo is only a few weeks away so start looking for mangoes to hit your farmer’s markets and stores so you can whip up a few of these Spicy Mango Margaritas. When you start enjoying don’t forget to snap a pic and post it on social media with #TakeTwoTapas! Peel and dice your mango no bigger than 1-inch pieces. Place your mango and water in your blender. Pour into a storage container for use in your mango margarita or smoothies. Add 2 cups of your mango puree and 1 cup ice to your blender. Blend to crush the ice. Add the tequila, triple sec, lime juice, and the chili pepper simple syrup to the blender. Taste to make sure it the flavors and tartness are to your liking. Leave in the blender while you rim your glasses. Combine the kosher salt and the Tajín seasoning. Take a lime wedge and run along the rim of your glass. Dip the glass in the Tajín salt seasoning mix to rim the glass. 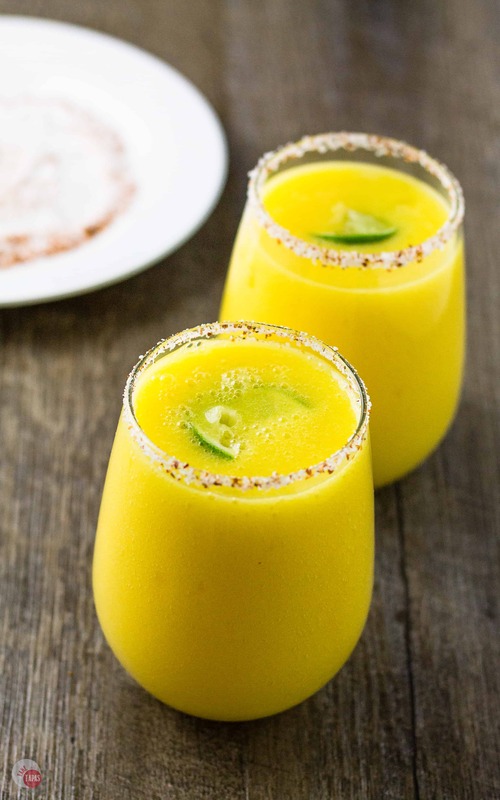 Fill your glasses with mango margaritas and enjoy! I love Margaritas and the spicy Mango of this sounds Amazing!